Last week I decided I needed a short-attention-span project in the middle of all the busy-ness that was going on. So I whipped up a couple of throw-pillows that have been on my to-do list f o r e v e r. It was so satisfying! I actually made these from a table runner, which is why they came together so quickly. Here’s the details. During the “Great-Basement-Cleanout of ’12” I went through my box of upholstery/home-dec fabrics. A while ago, if I ever saw a good remnant for cheap I would buy it for bags or throw pillows. (I stopped buying not long ago because I had accumulated a large stockpile that I hadn’t actually done anything with.) As I went through that box, I resolved to pull them out and put them to use. 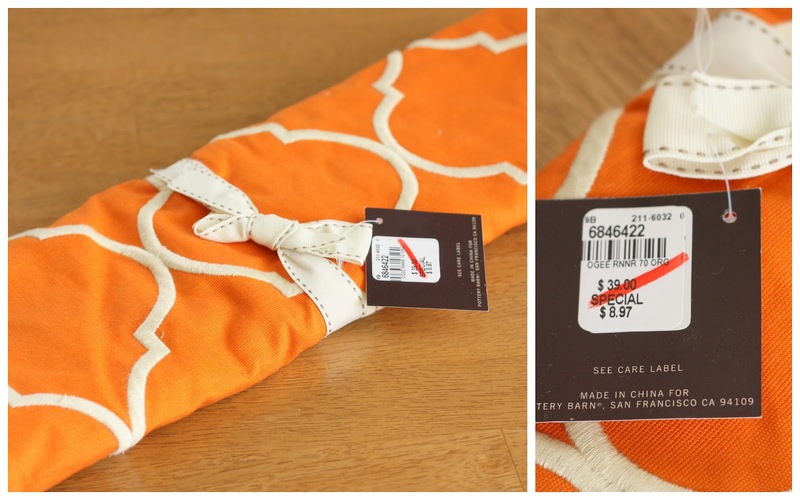 One such accumulation was this fabulous orange stitched table runner from the Pottery Barn that I got for 75% off. I’d originally thought I’d make it into a bag, but the color is so great with my living room, I opted for fast throw pillows instead. Here’s how I made them. You’ll want to cut your length to measure twice the width of your runner. My table runner was long – I think 18″ x 70″ – so I was able to get two lengths by cutting it in half . Since the edges of the runner were all nicely finished already, and I was mostly doing topstitching, a good, matching thread is a good idea. First, I folded the table runner piece in half, right sides together, and sewed the cut edge to the top edge of the runner piece. I used slightly larger than a 1/4″ seam allowance. Once that was done, I turned the piece right-side-out and it resembled a large tube with two open sides. Making the new seam, the bottom of the pillow cover, match-up the open sides and pin. Sew one of the open sides, closed, by top-stitching right along the edge, hiding the stitching in the finished stitching that was already there. Now my piece resembled a large square with only one open side. Stuff the new case using a pillow form – I used an old pillow I already had. And voila- a fancy finished throw pillow! Not the most professional method, but it worked for me and was so slick and easy. Fortunately, the throw pillows in this room don’t get quite as hammered as the ones in my family room, so I feel they have a good chance of lasting for a while until they get beat-up or I somehow get tired of the orange. And I figured for $4.50 a pillow, it was worth the risk. Now I’m motivated to actually make some other throws with this other piece of yardage that has been sitting next to my couch for way too long. Maybe this time I’ll actually put a zipper in too. Thanks so much for all the sweet comments on ‘real life.’ In exciting news, I get to getaway this week to a little sewing retreat in the mountains for a couple of days. Woohoo! It’s probably going to be hectic getting myself out the door, but I have a feeling it will be worth it. The timing is GOOD. Your pillow covers look fabylous. :0)<br />Thanks for showing us how. These are so pretty! I like the phrase &quot;short attention span project&quot; because that&#39;s just about all I do anymore:p Thanks for the tutorial! Hope you have (are having) a great time at your retreat! Very very cute Amy! Great use of a runner!!! I live in Marrakech and that fabric looks so Moroccan! Very cute. Nice tut! I will be looking for table runners in clearance sections now. <br />Have a wonderful time on your get-away! I did the same thing but with white table runners that I had purchased years ago. I&#39;ve been doing applique or embroidery on them for different holidays. Never thought when I bought them to find other colors for pillows, my mind went straight to what it already was. I had purchased 3 and I&#39;m now down to my last 1/2. Have fun on your sewing retreat. Love these. I&#39;m a bit jealous. I wish I could run out and buy the table runners to make some for myself. I adore the design and the color. Love your &quot;runner&quot; pillows. Have a great time sewing at your retreat! GREAT idea! Thank you for sharing, this is brilliant. Very nice!! Short attention span projects are a must have for sanity sometimes. 🙂 love your new pillows. Gorgeous pillows. Now I will be on the look out for sale table runners that will make fabulous pillows. Great price too! They&#39;re Perfect Amy. And Adorable!!! Amy you are so SMART! 🙂 Buying a table runner that cute on sale was brilliant, and look, your pillows are lovely. Way to go! Hope you have a great sewing weekend coming up! Fantastic pillows! You are so hip using the color Tangerine, little did you know when you kept your orange chairs and orange table runner that you were ahead of the wave! Have fun retreating, wish I was. You will come back all energized and ready for more &quot;Real life&quot;. Your awesome! What a great idea!!! The pillows look incredible on your couch! Fantastic use of a table runner. The colour is amazing! Love, love, love! these look great!!! i love using something like that runner for something new…a year or so ago i used a old curtain to back all my new quilted living room pillows. so much fun. this is a great idea. me too! I love getting a great buy and then using it for something other than what it was intended. The orange print is great and just Puuurrr..fect! Have a great time relaxing and retreating!! My mother picked up a ton of table runners and place-mats after the holidays at a local Dollar General Store. Some of them are really nice and look almost like tapestries. We are going to make a few into pillows and even into wall hangings by adding a tree branch and loops. These literally cost her anywhere from 10-80 cents, yes CENTS! LOL! I used the same table runners for this quilt http://auntspicy.blogsot.com/2010/12/orange-crush.html it must run in the genes!